When the wind and rain start to blow during your solo mission, reach into your pack, and pull out the super-compact and lightweight Black Diamond Twilight Bivy. 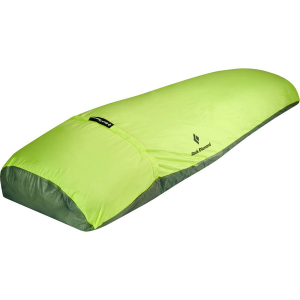 The water-resistant NanoShield fabric seals out the elements as it surrounds your sleeping bag and breathes better than virtually any water-phobic fabric on the market. A zippered opening at the shoulders provides easy access and lets you sit up to stretch your aching muscles in the middle of the night.